V. Walter, Staub, N., Franchi, A., and Saska, M., “UVDAR System for Visual Relative Localization with application to Leader-Follower Formations of Multirotor UAVs”, IEEE Robotics and Automation Letters, 2019. H. Yang, Staub, N., Franchi, A., and Lee, D., “Modeling and Control of Multiple Aerial-Ground Manipulator System with Load Flexibility”, in 2018 IEEE/RSJ Int. Conf. on Intelligent Robots and Systems, Madrid, Spain, 2018. V. Walter, Staub, N., Saska, M., and Franchi, A., “Mutual Localization of UAVs based on Blinking Ultraviolet Markers and 3D Time-Position Hough Transform”, in 14th IEEE International Conference on Automation Science and Engineering, Munich, Germany, 2018. N. Staub, Mohammadi, M., Bicego, D., Delamare, Q., Yang, H., Prattichizzo, D., Robuffo Giordano, P., Lee, D., and Franchi, A., “The Tele-MAGMaS: an Aerial-Ground Co-manipulator System”, IEEE Robotics and Automation Magazine, vol. 25, no. 4, pp. 66-75, 2018. 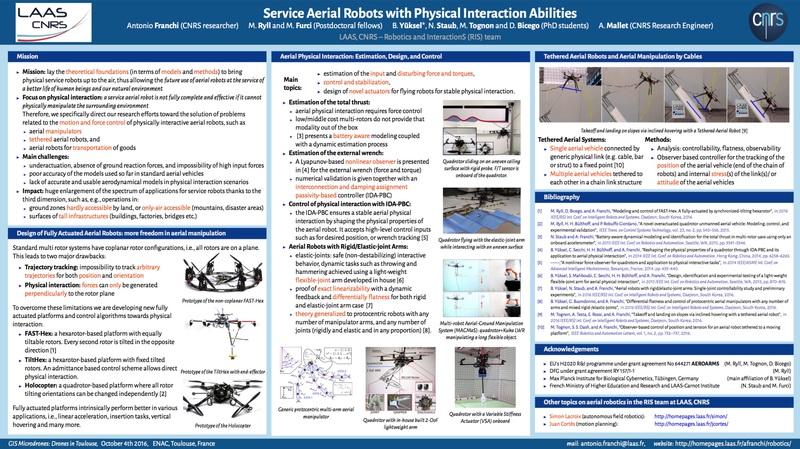 N. Staub, Bicego, D., Sablé, Q., Arellano-Quintana, V., Mishra, S., and Franchi, A., “Towards a Flying Assistant Paradigm: the OTHex”, in 2018 IEEE Int. Conf. on Robotics and Automation, Brisbane, Australia, 2018, pp. 6997-7002. N. Staub, Mohammadi, M., Bicego, D., Prattichizzo, D., and Franchi, A., “Towards Robotic MAGMaS: Multiple Aerial-Ground Manipulator Systems”, in 2017 IEEE Int. Conf. on Robotics and Automation, Singapore, 2017, pp. 1307-1312. B. Yüksel, Staub, N., and Franchi, A., “Aerial Robots with Rigid/Elastic-joint Arms: Single-joint Controllability Study and Preliminary Experiments”, in 2016 IEEE/RSJ Int. Conf. on Intelligent Robots and System, Daejeon, South Korea, 2016, pp. 1667-1672. N. Staub and Franchi, A., “Battery-aware Dynamical Modeling and Identification for the Total Thrust in Multi-rotor UAVs using only an Onboard Accelerometer”, in 2015 IEEE Int. Conf. on Robotics and Automation, Seattle, WA, 2015, pp. 3341-3346. Do not forget to watch also the videos attached to my publications!